We heard about the Ancaster Satellite Campus plan from the 1960s. Here's a plan that also didn't materialize, again, thankfully due to resistance from the community. 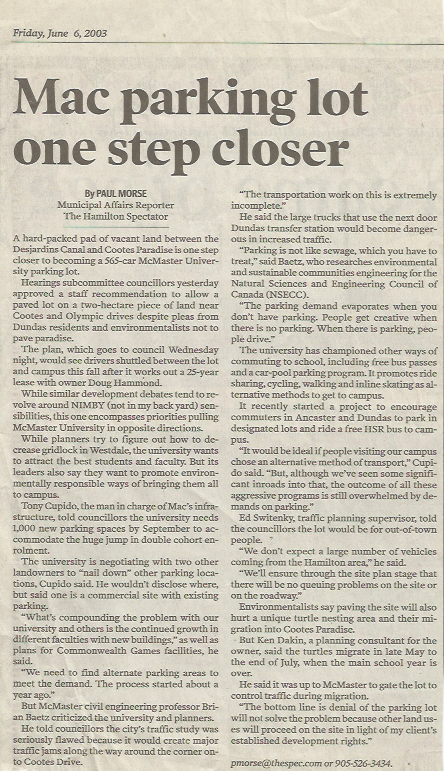 McMaster's need for 1,000 more parking spaces also never became in issue as the parking projections were unrealistic. The article reveals the car-centric attitude of both McMaster and the City of Hamilton staff - and illustrates the opposing viewpoint sagely expressed by Dr. Brian Baetz: "parking demand evaporates when you don't have parking. People get creative when there is no parking. When there is parking, people drive." We certainly encourage McMaster to keep this in mind when they look at their parking programme. Reducing parking will open up much better land-use options than storing cars for short periods of time.